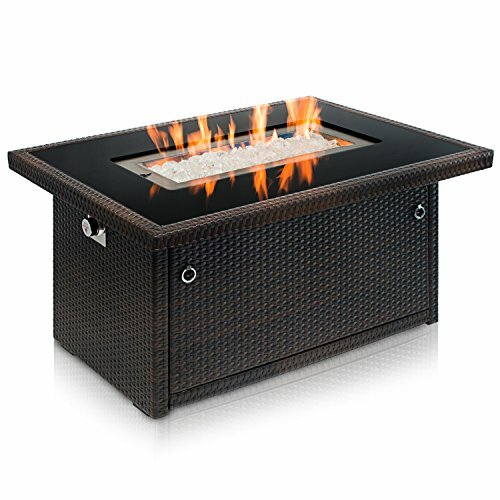 Head on over toAmazon where you can grab this Outland Living Series 401 Brown 44-Inch Outdoor Propane Gas Fire Pit Table, Black Tempered Tabletop w/Arctic Ice Glass Rocks and Resin Wicker Panels, Espresso Rectangle for ONLY $429.99 (was $559.99). LOWEST PRICE! ✓ INTERNATIONAL DESIGN AWARDS WINNER – perfect addition of functionality and style for your backyard patio fire pits. This stunning rectangular fire table creates a truly unique fire feature that perfectly compliments any outdoor space that will draw the attention of your family and guests. ✓ DURABILITY & QUALITY – impressive strength and durability, low maintenance, and resistance to heat. The coffee colored UV HDPE (Ultraviolet Light High Density Polyethylene) wicker is a reliable all weather resistant material that will last. Meanwhile our powder-coated aluminum frame construction offers a strong and sturdy base. ✓ CONVENIENCE FEATURES – table dimensions: L 44″ x W 32″ x H 23″. Unit includes pre-attached 3-Ft hose with regulator, 8 mm black tempered glass tabletop and 15.5 lb Arctic Ice decorative glass rock set. Sit back and admire the reflection of the dancing flames while keeping warm and cozy within the heating radius of this impressive outdoor centerpiece. ✓ SAFE & CSA APPROVED – stainless steel burner with highest safety standards is rated 35,000 BTU for terrific flame presence while the push button spark ignition system provides simple and convenient control when lighting. Chrome manual control valve allows 100% smoke free variable flame height. Easy and simple access to interior storage of standard 20-Lb propane tank (not included).